pure chiffon dupatta wid santoon bottom. 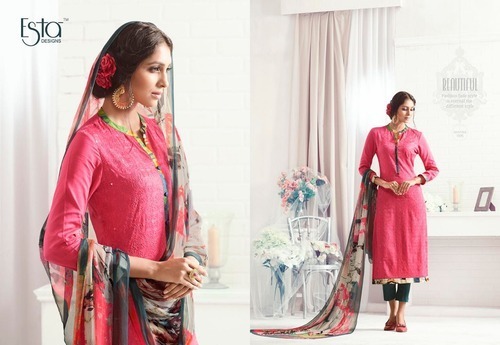 Established in 2013, Satguru Teri Oat is one of the leading wholesalers, traders and suppliers of Ladies Cotton Suits, Crepe Suits, Ladies Designer Suits, Ladies Gowns, Ladies Georgette Suits, Ladies Pakistani Suits, Lehenga Fabric Satin and Pure Chiffon Suits. Our cloths are extremely admired due to their superior finish, fashionable look, light weight, long-lasting nature, colorfastness, and strongly stitched. All our cloths are fabricated by vendors using the finest quality textile, which is achieved from reliable retailers of market. Vendor’s fabrication unit is embedded with advanced stitching machine to make these clothes as per current market trends. We are quality driven organization and all the clothes that we present to our patrons are as per the worldwide quality parameters. In addition, we supply these clothes in diverse patterns that meet on customers demand.